Parma’s best hotels for the luxury traveller. Whether it’s business, pleasure or both that bring you to Parma, there’s a hotel for you among the top 5 hotels rated by your fellow travellers at TripAdvisor. There’s a lot history in Parma, no better reminisced than at Teatro Farnese, an ancient wooden theatre with a fantastic historic atmosphere. The Magnani-Rocca foundation offers a permanent exposition of paintings and sculptures, and everybody loves Castello di Torrechiara: a classic example of Italian castle architecture and frescoes, with incredible views of the Langhirano countryside. If you’re a business traveller, you won’t need to see the sights. You’ll appreciate affordable and reliable internet access. The breakfast on the way out doesn’t have to be fancy either, just good enough to get you started on your busy day. The Best Western Hotel Farnese, Grand Hotel de la Ville and Hotel Stendhal provide free wireless internet access. The breakfasts are crowd-pleasers at any of these hotels, probably because they all serve wonderful Parma ham, but the favourite when it comes to mornings is Hotel Stendhal: Strong flavourful coffee, lots of fresh bread and fruit choices. If your overall satisfaction from a hotel stay is in the breakfast, stay at the Stendhal. 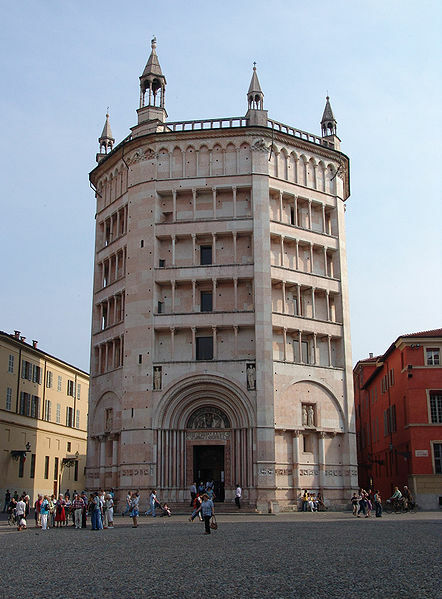 If you’re in Parma to see the sights, you’ll want fast access to as many of them as possible. Starhotels Du Parc gives you a fifteen minute walk into the centre of Parma using the rear entrance, a bridge and pathway through a beautiful city park. The Hotel Stendhal is a winner again for the sight-seers with close proximity to the city center, fine restaurants like La Greppia, and the archaeological museum across the road. Not mentioned yet among the top five is the Ora Hotel. It’s three kilometers from the center of Parma so it’s not ideal for sightseeing on foot; you’ll need a car for that and pay for parking when you go to town. The rooms aren’t big compared to the other hotels and the charges for wireless internet will have you firing up your smart phone’s internet tethering right away. You might miss the in-room coffee and the breakfast area is small so if the hotel is busy, you’ll need to get down there early. Despite all this, there’s one real value in a stay at the Ora: it’s quiet. For business or pleasure, it’s easy to find your favourite hotel in Parma.